In one word, huge. And there were some other lesser structures and vegetation nearby that prevented me from getting a wide view of this place. 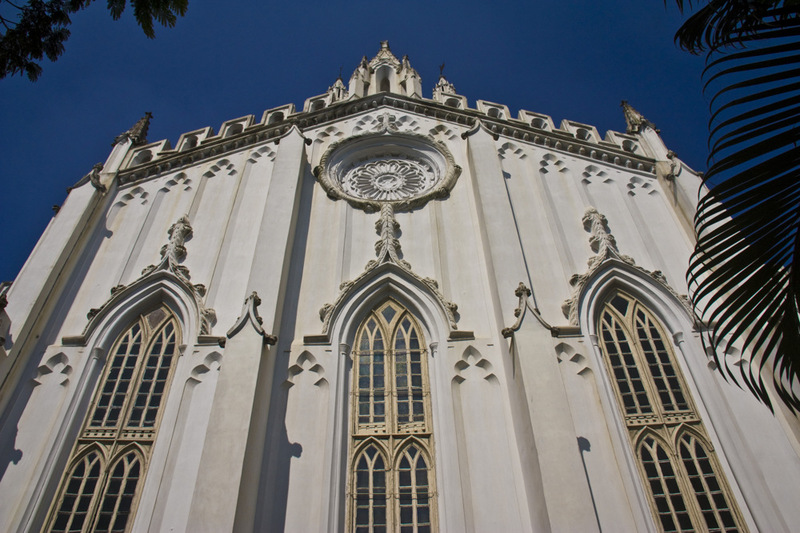 St. Paul's Cathedral in Kolkata was built in 1847 in Gothic style. The stained glasswork inside is excellent however, photography is not permitted inside. This site is close to some other attractions such as the Birla Planetarium and Victoria Memorial. Thats an heroic view of the building, Ayush. Wow - it does feel huge! Nice light - and I like the palm! Gothic and exotic plants is always an odd combination. Very fine image too, Ayush. It has a great deal of Victorian Gothic looks to it, just like a lot of similar churches in the U.K.
Those swags over the windows look positively Portuguese manueline!